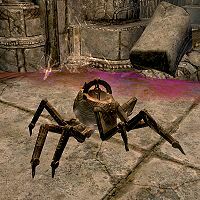 Aicantar's Spider is a Dwarven spider that Aicantar reassembled and can control with his spider control rod. Picking up the spider control rod in Calcelmo's Laboratory will cause it to pop out of a Dwarven scuttle. It will try to kill anyone who is hostile to the holder of the rod. The rod works like a staff, and the spider will move to the location targeted by the rod. According to Aicantar's journal, found nearby, the guards are afraid of it because of several incidents where Aicantar would become mad at a guard, or a guard would draw a weapon and the spider would try to kill them. It cannot leave Calcelmo's Laboratory. If anyone becomes hostile to you and you move too close to the spider, it will become hostile to you. It is possible that you may not be able to pick up the staff, making you unable to control the spider. This page was last modified on 30 August 2018, at 19:47.